Oh So Bright: Our Trip to Scotland! Get ready for another picture overloaded post! Our good friends, Matt & Kara, came to visit us from the states for a little over a week. 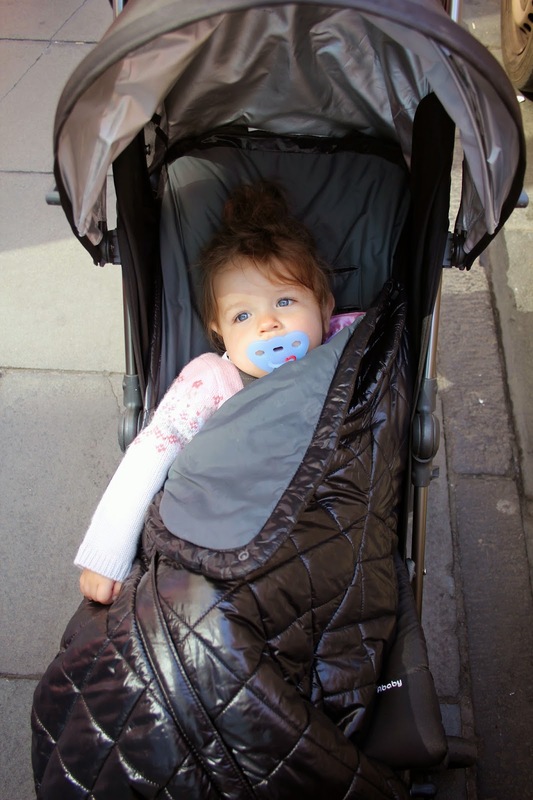 We spent a few days exploring neighboring towns, and then headed to Scotland for a few days! We stayed in Edinburgh, Scotland and traveled to Inverness one of the days. It was actually really great weather the whole time Matt & Kara were in town. I swear the moment they left the rain came back! The five of us (including Maggie) drove there and met up with Josh & Cait. The four of them went on a bus tour that was an overnighter. We weren't able to go because Maggie wasn't old enough, so we did a little exploring of our own for a few days. 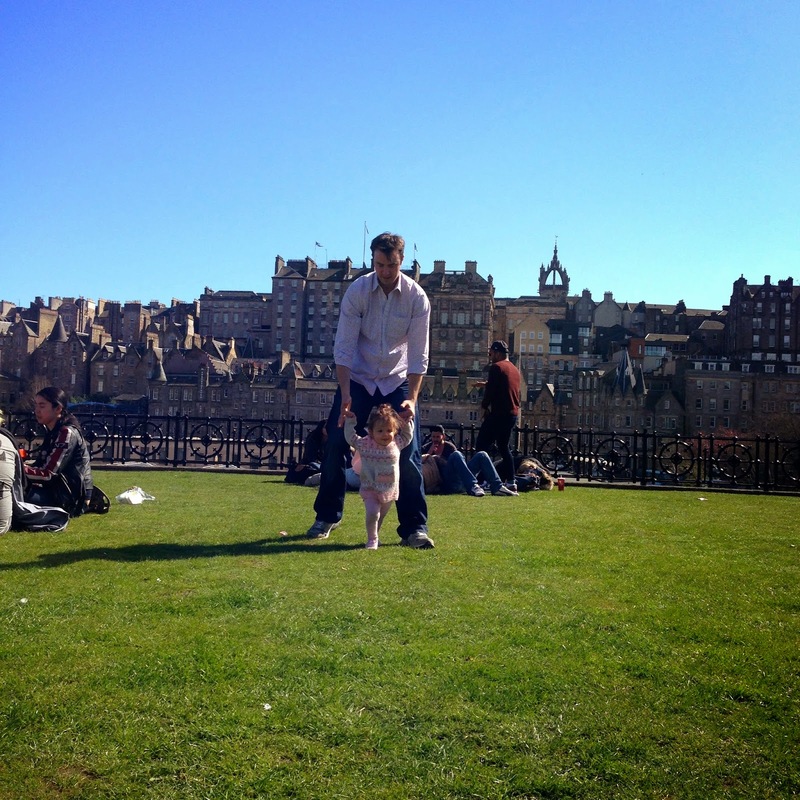 I think I like Edinburgh more than I liked Paris! It was just so green and had beautiful architecture. Tons of rich history everywhere you turned. I didn't realize just how big this city really was. 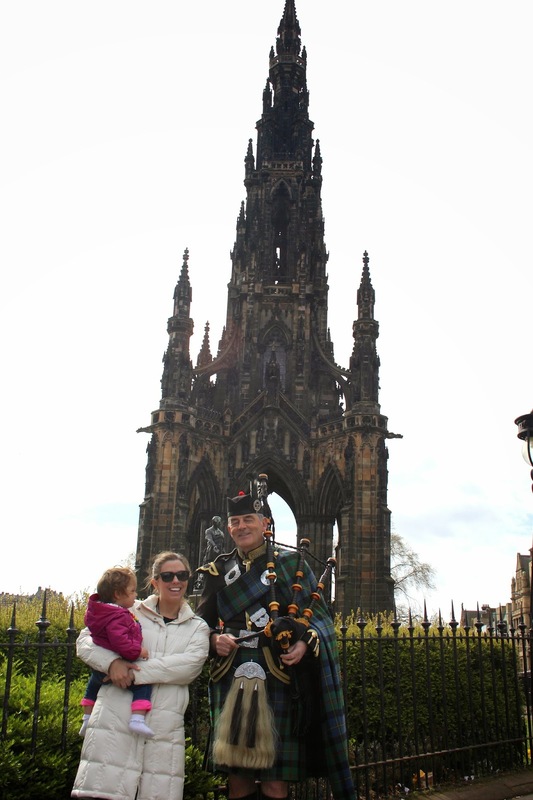 Posing in front of the Scott Monument with a bagpiper. He asked what Maggie's favorite song was, and I didn't know. So he played Twinkle, Twinkle Little Star for her. How sweet! I could have spent a whole month here and still not have come close to seeing everything! The first thing we did was hop on a bus tour. We really like doing that first to get the lay of the land. Plus, it's really easy to do with a baby. All the streets were picture perfect. 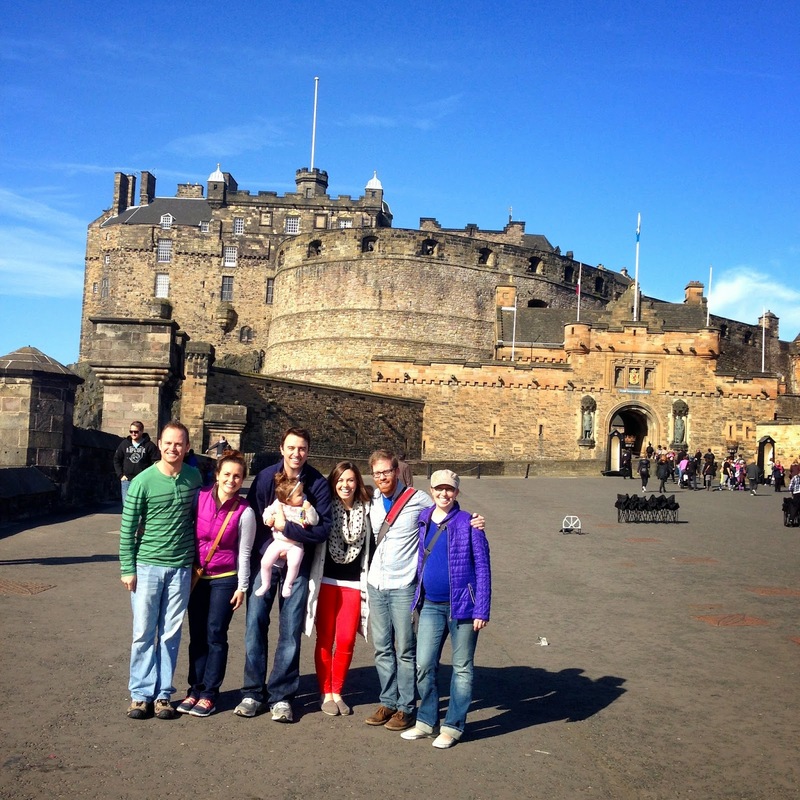 We walked up to the Edinburgh Castle to check it out but waited to go inside until our friends could join us a few days later. 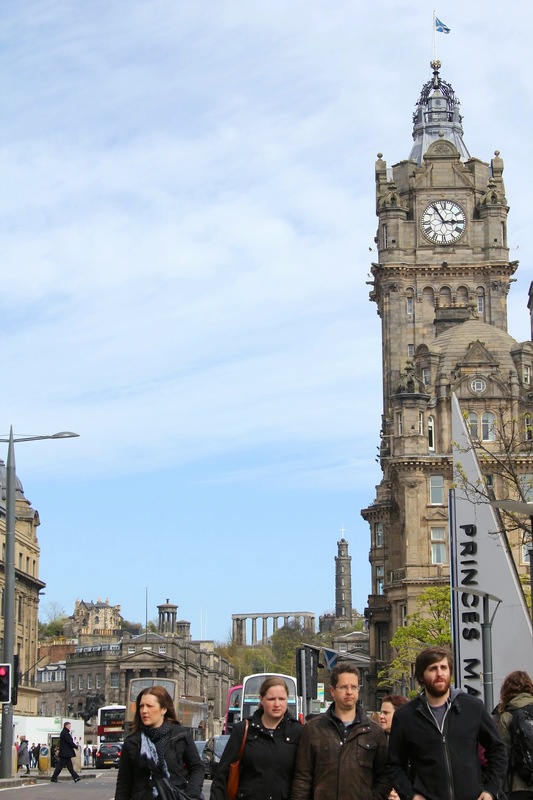 We then decided to walk what they call the "Royal Mile". It's the distance between the castle and the palace. It's actually a little over a mile but they thought it wouldn't sound as good called the royal mile and a bit. Ha! We then got a hair brain idea to walk up to Arthur's Seat on top of a hill in Holyrood Park. With a stroller, huge diaper bag, and Maggie in tow we climbed what turned out to be one very steep and rocky hill! The scene behind Ryan & Magg's was the easy part. Ha! That's our shadows climbing the path. I love how you can see the rain clouds on the right side. It never rained though! Once we reached the top it really reminded me of San Francisco! There are a lot of hilly streets in this city as well, and there is even a bridge modeled after the Golden Gate. So beautiful. You can see the castle on the hill in the center of this photo. Victory photo! It was super rocky the last third to fourth of the trail but Ryan was a haus. There were guys up there giving Ryan props for climbing the trail with a baby and stroller. Ha! It was pretty windy up there but had the most beautiful sights of the city. After making our way down the mountain of a hill, we stopped to catch our breath at a little pond and watch the swans. I think Maggie could have stayed there all day. Since we were pretty spent we called it a day and headed back to the hotel. 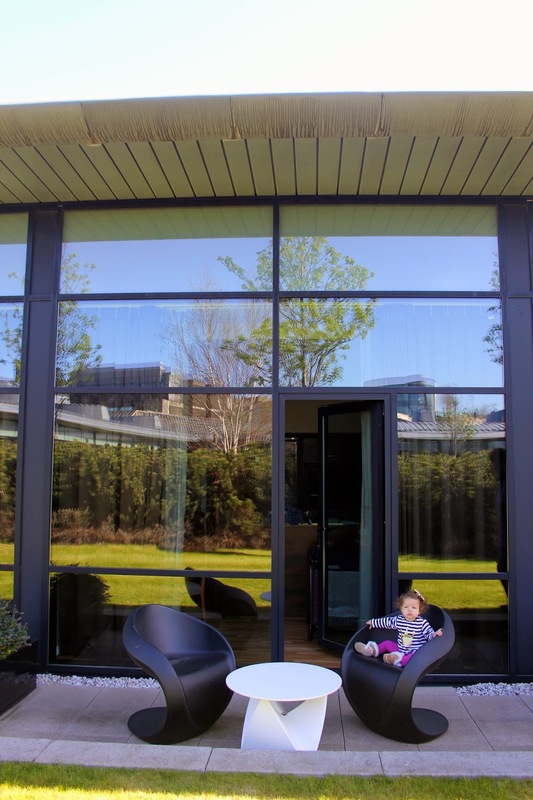 We stayed at a place called The Glasshouse. It was a really cool mix of modern and old world. Our room led out to a little patio that led out to a really neat larger outdoor area. It was a pretty artsy hotel. Maggie was always drawn to these every time we walked past them. The next day we lost our minds again and decided to drive up to Inverness to check out Loch Ness. I didn't realize how long of a drive it was but at least it had some gorgeous views! Poor Maggie probably has never been in a car that much before in her life, but she did really well considering. We made it to a little village located right off Loch Ness and found out there were some castle ruins. It's called the Urquhart Castle. After checking that out we headed back into the village to buy some tickets for a boat tour. I mean we came all this way to see this lake and look for the Loch Ness Monster, we were going out onto the lake! But not before we had an ice-cream break. This is the face she makes after every lick. But she always goes in for more! Once we were on our boat we had a few visitors join our tour. Maggie was in heaven! The lake is actually really cold because it's extremely deep since it's on top of a crevasse. It's a narrow lake that connects the sea to the ocean. Of course Maggie made some friends on the boat. We had to break out some snacks for her that ended up getting all over. She most have made quite an impression on this lady to let her hold her hand and get food all over her! No luck on finding Nessy! Our last and final day we were able to spend it with our friends. First stop was to the castle! This castle was a little different than some of the other ones we've seen. It sits up on a hill and it's more of a town than one big building. Love this shot with Matt photobombing. Scotland reminded me so much of different places around the US. At one point I thought I was in San Fran, then in Colorado and then what I think would be like Alaska. I had to include this one. It cracks me up for some many reasons. I was originally taking the picture because of the man in the center's clothes. Then I saw Josh on the left making a face at me and Kara on the right taking a picture of us taking a picture. Maggie strolling along with daddy. She really was such a champ being hauled everywhere and being completely off her schedule. We had so much fun with these guys. And miss them already! 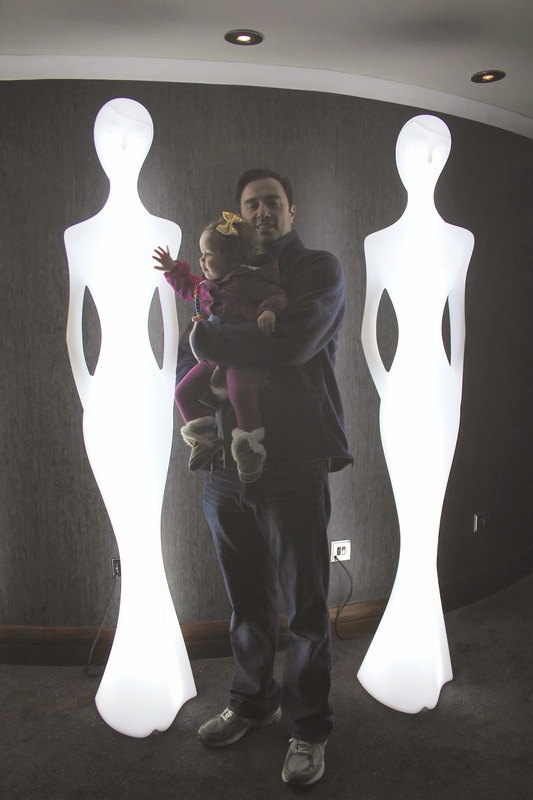 Next time we see Matt and Kara they will have another baby!! Can't wait to visit them and family this coming fall. Oh my goodness I want to go to Scotland so much right now! 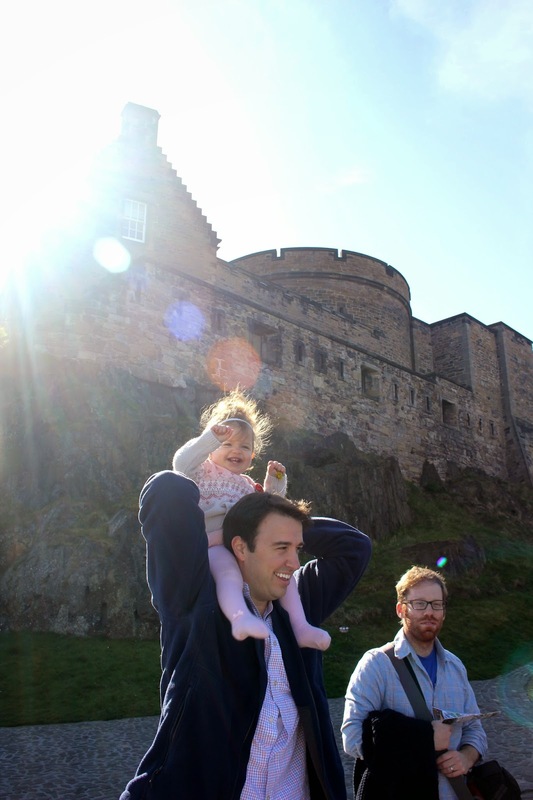 Also the pick with maggie on the top of Arthur's Seat is adorable.